... Rachel with her submission Nr. 47! Congratulations! Rachel, please email macy@gerdasteinerdesigns.com to claim your prize! Now we would like to mention 3 cards/projects that stood out to us! Sarah created the perfect scene for these little bunny friends. 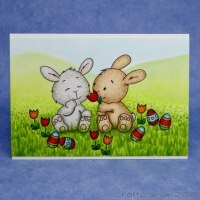 Just love this a whole lot and it shows that it just takes a few tiny eggs to turn this card into an Easter card! Brenda created this sweet card and I really love the colors of the background as those pastel colors create the right mood for the springtime, don't they? A whole field of tulips. Just so adorable! Love the softness of the grey and pink as they play so well together! Thank you all for playing along. I feel so blessed that you are playing along with our monthly challenge and I really hope that you'll enjoy the new challenge image!